Get quotes from movers who are licensed through the U.S. Department of Transportation. Movers in the Great Guys network offer insurance to protect your belongings in transit. From assistance loading a truck to a full-service relocation, customize your move to fit your needs. Start receiving free moving quotes instantly when you fill out our easy-to-use form. Pro moving crews are knowledgeable and armed with the tools needed to do the job right from the start. Planning to move art, your car, appliances, or something else long distance? We can help with that too! Great Guys helps you compare rates, so you can find trusted long-distance movers for less! The average long distance move costs thousands of dollars. The hefty price tag is just one of the reasons it’s important to shop around for moving companies. Hiring movers reduces a lot of the stress and anxiety that come along with an out-of-state or cross-country relocation. Instead of doing it all yourself, you can rely on experienced professionals to handle most of the moving logistics for you. We help you connect with licensed moving companies that service your moving route. Armed with free moving quotes from multiple movers, you can make a smart decision about who to hire, while sticking to your budget. Your moving needs are unique to your situation. With Great Guys, you can find full-service movers capable of handling every aspect of your relocation. If you’re trying to keep your long distance move as affordable as possible, you might want to hire a mover to solely handle the transport of your household goods. If you are pressed for time or feeling overwhelmed, you might want to hire a service that can do all the boxing, wrapping, and packing for you. Or you might just be looking to ship your car, move your appliances and furniture, transport your piano or rent a moving container. No matter your needs, you can find the services you need to accommodate your specific relocation through the Great Guys moving network. At Great Guys, we’ve been in the moving business for a long time. In our years of experience, we’ve gleaned lots of wisdom about all aspects of the moving process. Our goal is to equip you with this knowledge, so you are well-prepared for your move. No matter what stage of the moving process you are in, you can check out our blog for tips and advice to assist with this time of transition. From articles on what size moving truck to rent, to the cheapest ways to move long distance, to strategies for selling your furniture on Craigslist, the blog is chock-full of tips to make your move more affordable, more manageable, and more organized. Credentials are one of the most important things to ask about when hiring a mover. After all, the moving industry is saturated with unlicensed scammers trying to make a quick buck. When you find movers through Great Guys, you can rest assured that we’ve already done the legwork to vet each one. We only work with long distance moving companies who are licensed by the Federal Motor Carrier Safety Administration (FMCSA), a division of the U.S. Department of Transportation. Unlike a regular Joe using his pick-up truck to haul stuff, these companies must maintain specific safety, insurance, and operational standards to keep their licensing. These standards protect you, the consumer, from unsavory and deceptive business practices and enhance the safety of your belongings throughout the move! Moving long distance might seem difficult, but with Great Guys, it doesn’t have to be! Instead of trying to tackle the move on your own, use the Great Guys platform to find professional moving help that doesn’t cost an arm and a leg. Start your move on the right foot today by filling out a quote form. Based on your inputs, we’ll start providing you with long distance moving quotes from top carriers immediately, so you can find an affordable, licensed mover fast. Then, browse the site for helpful tips on packing, decluttering, prepping appliances, and more, so you’re ready when moving day arrives. Make this the easiest move you’ve ever made! Moving out of state is no easy feat. Whether you’re moving for a new job, to be closer to family, to live in a warmer climate, or for a different reason, the stress of relocation can take its toll. During this time of transition, the greatest help comes from hiring a long distance moving company you can trust to handle your move. Since the interstate moving process is a bit more complicated than a simple move down the street, we’ve taken the time to compile all the information you should know before hiring movers. Yes, it’s lengthy, but we’ve tried to think of every detail you might need to know about the long-distance moving process. Prepared with facts, you’ll be better equipped to embark on your long distance moving experience. You have lots of options when it comes to customizing your move. Here are the services available from our network of long distance movers. Learn the difference between the types of moving quotes you’ll likely receive. 4 best reasons you want to use a real moving company and not rely on friends. The 7 steps that you’ll go through for all nationwide moves. While hiring a pro is the most convenient and least stressful option for tackling a long distance move, it’s not the only option you have. Read about possible alternatives. There’s a lot of mumbo jumbo jargon in the moving industry – we’ll explain it for you. Curious about the nationwide average cost of a long distance move? Don’t forget to compare this to our quotes. Be warned & prepared for these common moving scams. If the thought of having to organize everything you own into boxes makes you want to pull your hair out, then let the movers do it. Full-service moving companies offer packing and unpacking services to make your transition smoother. A few days before the scheduled move date, they’ll show up with premium boxes and supplies, then go through each room wrapping breakables and packing your items. They’ll seal each box, then stick a label on it, so they’ll know right where it goes when it reaches your new home. At your moving destination, the movers work swiftly to unload the truck, then unbox your belongings and haul off the trash, so you’re settled in almost immediately. From couches to armoires to dining room tables, long distance movers make hauling your furniture across the country much easier. Perfect for those who don’t know a nut from a bolt, most moving companies are happy to help with basic furniture disassembly and reassembly (i.e. bedframes, bookshelves, etc.). Your moving crew will take apart items as needed, then carefully wrap each piece in padded moving blankets to prevent damage during transit. Furniture is loaded onto the moving truck and secured with ratchet straps to keep it from shifting or falling over. At your new home, movers make quick work of unloading furniture, reassembling as needed, and positioning your things just where you want them. A small move could mean you’re moving the contents of a studio apartment, a handful of appliances or a specialty item like a pool table or piano. If you fear your small load isn’t worth the hassle of hiring movers, think again! Most nationwide moving companies allow customers with smaller loads to “piggyback” their load onto an existing shipment. Once they’ve loaded part of the truck with another customer’s items, they’ll swing by your place and pick up your shipment to fill up the empty space. This makes logistics more efficient for the moving company and the move cheaper for you! You could move your small load via a moving company for less than the cost of renting a U-Haul. Whether you’re moving an upright or a grand, it takes a lot of effort and skills to safely transport your instrument. Movers should be specially trained in the proper techniques for moving your piano to prevent damage to this expensive and heavy piece. A professional long-distance mover sends a team to your home to dismantle the piano, box parts and pieces, and wrap the instrument, so it’s ready to move. They’ll use caution when moving your piano from the house to the truck, using specially designed piano moving equipment and several men to steady the instrument. For transport, the piano is secured inside a clean moving truck, draped in moving blankets and secured to the wall to prevent it from moving. When you hire movers, safely transporting this instrument is one less thing for you to worry about. Most moving companies can hook you up with heavy-duty moving supplies that professional movers use. You might even score some free boxes if you ask. Alternatively, if you want to save money (and the environment), try getting used boxes from the grocery or liquor store. Renting large plastic bins is another popular option too! Most moving companies are registered as movers of household goods. This type of licensing does not encompass the transport of motorized vehicles, but some of the bigger companies (think Atlas and Mayflower) are licensed to ship cars as well. Great Guys offers you the convenience of shopping rates on long distance household movers and long distance auto shipping companies with one simple quote form. We can also help you find a company or container service for shipping your motorcycle. From microscopic apartments in the heart of Manhattan to Texas-sized homes in the suburbs of Dallas, there’s no household too small or big for Great Guys to help. So, whether you’re looking for apartment movers from L.A. to NYC or residential moving services from Chicago to Miami, we’ve got your covered. Work with a long distance residential mover to plan the details of your upcoming move. From packing your home to dismantling your pool table, our network of moving companies does it all to ensure your household makes it efficiently from one home to the next. Taking that gorgeous front-loading washer/dryer set or that fancy digital display fridge with you to your next place? We don’t blame you! Appliances are some of the most expensive items you can purchase for your home, so taking them with you when you move is an excellent idea. Appliance movers make fast work of disconnecting and prepping your appliances for the move, taking care to wrap them with moving blankets, so they don’t get dings or scratches. You can stand back and watch while they load the appliances onto the truck using appliance dollies to protect your floors. With professionals doing the heavy-lifting moving appliances long distance has never been easier! Art is vulnerable to many threats while in transit – temperature fluctuations, moisture and mishandling could cause warping, deterioration, mold, or discoloring. Because of its susceptibility, it’s important to hire movers that specialize in art handling. Pro art movers know how to package or crate your paintings and sculptures using acid-free materials, so they are protected during every step of the move. Most art handlers transport your pieces in a climate-controlled vehicle to prevent damage from mildew and mold. At the end of the long distance move, the moving crew works to install each piece for years of future enjoyment. Sometimes the stars just don’t line up for you to move straight from one place to another. If you find yourself between homes, most moving companies have warehouses or self storage facilities where they can safely stash your stuff. Movers pick up your load, deliver it to storage, then, when you’re ready, they drive it to your new home! This service from long distance moving & storage companies makes the entire moving process simpler. There’s lots to a long-distance move besides just physically moving all your belongings. During this chaotic time, the last thing you need to be worried about is how to get that giant refrigerator onto a moving truck without injuring yourself. You are busy enough finding a new neighborhood in an unfamiliar city and checking out the job market in your new hometown. Bottom line – letting a moving company handle logistics like this just makes your life easier. Driving a moving truck is harder than it looks – especially when you’re going hundreds or thousands of miles. Whether your normal ride is a Mini Cooper or a Hummer, nothing will adequately prepare you for the challenges of driving a moving truck (blind spots, lane changes, traffic, sharp turns, reversing, etc.). Hiring professionals means you get to leave the driving to someone else. It’s a rare bird who enjoys helping a friend move. Sure, decent friends will agree to help in exchange for pizza and a few brews, but deep down they’d rather be doing anything else besides playing moving truck Tetris. Hiring a moving company eliminates any possible moving day resentment among friends. Licensed movers have the knowledge and the equipment to get the job done correctly. They’ll know the proper way to pack and handle that hand-me-down heirloom furniture or those delicate wine glasses so that everything survives the trip. Finally, one of the biggest perks of hiring professionals is that they assume the liability if something goes awry. Long distance movers are required to offer customers a full-valuation insurance policy. If you purchase this coverage, if anything is broken or damaged during the move, you’ll receive 100% of the money to repair or replace it. When you move yourself, the expense of anything you break or destroy comes out of your own pocket. Wondering what your cheapest options are for moving across the country? It’s smart to weigh your options. Here are the five most common ways that people move long distance. This DIY option gives you more flexibility to move on your own schedule. Book a one-way truck rental, load up your stuff, and drive it a long distance all by your lonesome. You can turn the truck in when you’re finished. 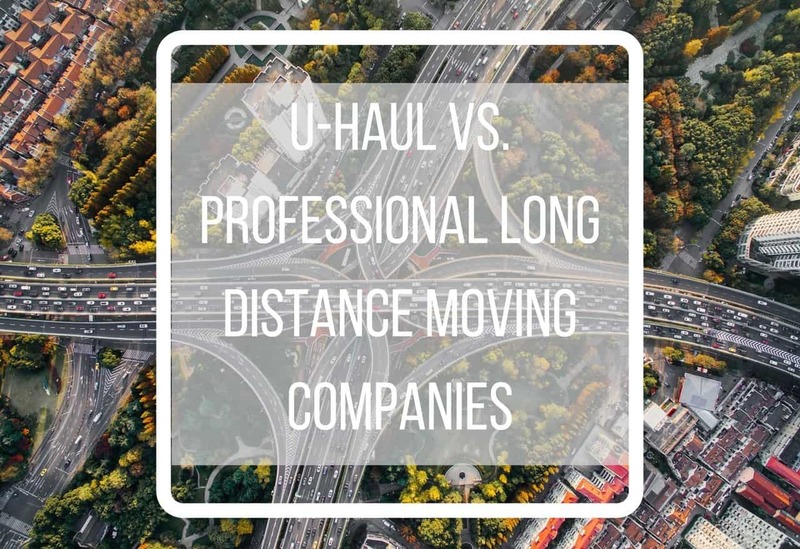 While a U-Haul is sometimes a cheaper option than a moving company, keep in mind that rental prices go up as the demand increases, which means it could get very expensive during the summer months when everyone and their brother is moving. This type of move is a hybrid between a DIY move and hiring professionals. Depending on the size of your move, one or a few containers are dropped off on your driveway. You fill them up, then give the company a ring to come back and get them. The containers are loaded onto an 18-wheeler and driven to your destination. This option is nice, because it affords more flexibility to get your stuff packed up and loaded on your schedule. It’s also convenient if you need storage between homes, because most container moving companies have their own storage facilities. You’ll still need to recruit volunteers or hire local movers to help load the pod, so make sure to factor that into your total moving costs. Some brave souls opt to barrel down the interstate towing a trailer full of their worldly possessions. This is an affordable moving option if you are moving a small residence, like a studio or 1-bedroom apartment. However, this isn’t practical if you have a larger home. Additionally, some drivers find towing a trailer a bit unnerving, so make sure you’re up for the challenge before renting one. If you’re moving a really long distance, it may not be worth the hassle of moving your things. It may be easier and cheaper to sell or donate most of your large possessions, like your bedroom set and living room furniture, and repurchase these items when you get to your new home. If you go this route, pack up your car with clothing and whatever else fits and take a road trip to your next destination. Your move will only cost what it takes to fill up your gas tank and service your vehicle. Though it’s not always the cheapest option, hiring a long distance moving company is certainly the most convenient option. If a full-service mover isn’t in your budget, consider doing the packing yourself to cut down on the cost. Additionally, ask companies for a “piggyback” or consolidated moving quote; combining your shipment with others significantly cuts down on the expense! Or just hire movers at each of the trip to load/unload your U-Haul or storage container, minimizing your work while remaining budget friendly. Compare Multiple Movers: You should get quotes and in-home estimates from at least three movers. This allows you to compare and save. Great Guys Moving provides you with quotes from multiple long distance movers in one place, making it easier to get rates and find the mover that works for your budget. Recycle Packing Materials: In addition to scooping up used boxes, get creative with those packing skills. Wrap delicate items in t-shirts or used newspapers, then fill the tops of your boxes with towels and washcloths to keep items from shifting. Declutter: The cost of a long-distance move depends on the weight or volume of your shipment. When the estimator comes to your home, he or she will take an inventory of your items, calculate the approximate volume of the shipment, then multiply that by a standard metric to get to an estimated weight. The final shipping weight is determined when the truck weighs in before and after picking up your shipment at a certified scale. If you’re thinking of paring down your pile of belongings, do this before you have the estimator come out. Depending on the type of quote you’re given, the estimated shipping weight can have a huge impact on your final bill. Pack Things Yourself: While we’d all love the royal treatment, if you’re trying to cut costs, then packing the boxes yourself is the way to go. Move During the Off-Season: About 48% of all moves occur in the 4-month span from May to August, which means movers are slammed and often charge a summer premium. To cut the cost, try to time your move during the slower months. Negotiate a Moving Allowance: If you’re transferring to another office or starting a new job, you might be able to talk your employer into giving you a moving allowance. Take a Deduction: If the boss-man says no to a moving allowance, you might be able to take a deduction on your tax return for your moving-related expenses. Consult a licensed bean counter for the fine print. Binding: A binding quote means that the final contract price is based on the estimated weight of the shipment, regardless of the final shipping weight. So, you pay the quoted price even if the shipping weight is less than the estimated weight. Binding Not-to-Exceed: A binding not-to-exceed quote means that you pay the quoted price unless the actual shipping weight turns out to be less than the estimated weight. In this case, the price would be adjusted down, making this the most favorable option for the customer. Non-Binding: With a non-binding quote, the final cost of the move will be determined by the actual weight of the shipment. However, the non-binding quote should give you a ballpark idea of the cost. Legally, a mover may not charge more than 110% of the original non-binding estimate provided. Be sure to show the estimator everything you plan on shipping. If you think you can cheat the system of a binding quote by sneaking extra items in after the estimator leaves, you’ll probably be caught with your hand in the cookie jar. Adding additional boxes to your inventory after the quote has been provided could make your contract void. We just need a few basic details about your move – approximate moving dates, moving to and from zip codes, and the size of your home. It’s also helpful if you provide us with real contact information so we can get in touch with you. You should always shop moving companies, especially for a long distance move. Once you fill out the form, you’ll receive moving estimates from up to four movers. Long movers are required to provide prospective customers with a free in-home estimate if you live within a certain radius of their office. Yes, finally something related to your move that doesn’t cost extra! Having an estimator survey your belongings is important for determining the final moving quote. Once you find a moving company that works for you, be sure to review the contract before signing. Pay special attention to terms like the insurance coverage and the bill of lading section (more on these later). As House of Pain would say, now’s the time to start packing. Start by ditching all that stuff you haven’t touched since the last move – like those boxes of VHS tapes, poor fashion choices from the 90s, and those bags of hotel toiletries you’ve been hanging onto. Once you’ve decluttered, get to work packing, wrapping, and taping up your life into manageable boxes with color-coded labels. Don’t forget to set aside a few moving week essentials. When moving day arrives, your movers will set to work getting the truck loaded with all your precious cargo. You can usually expect them to do the final prep work – like disassembling bedframes and crating any fragile pieces. After that, step back and relax while they muscle your things onto the truck. It can take as many as 3-4 weeks for the moving company to deliver your belongings. “Why so long?” you say. The time depends on a lot of factors, including the distance of your move and whether you selected a consolidated or dedicated shipment. While you’re waiting, why not take a vacay? Intrastate Movers: An intrastate move is one that stays within state borders. Even if you’re moving from Orange, TX to El, Paso, 859 miles away, this is still considered an in-state move. Intrastate moves are regulated by a state authority, usually the Department of Transportation. Interstate Movers: An interstate move, also known as a cross country moversor a long distance move, is one that crosses state borders. Long distance moves are regulated by the Fed through the US DOT Federal Motor Carrier Safety Administration. However, if your move crosses state lines within the same commercial zone, or metropolitan area, it is not considered an interstate move. For example, moving 10 miles from DC to Alexandria, VA is still within the DC metro area and would not be subject to FMCA regulations. Consolidated Interstate Move: Remember when we said it could take as long as 3-4 weeks to receive your shipment? A longer wait is more common with a consolidated interstate move. With a consolidated move, your belongings are placed on a truck that stops to pick up additional loads along the moving route. This type of move is cheaper for the consumer, more efficient for the moving company, and better for the environment. A win-win-win. Dedicated Interstate Move: Dedicated interstate moverspick up your belongings and delivers them directly to your new home without stopping for additional loads along the way. Moving Estimates: A written document that shows the estimated cost for your moving bill. Order for Service: A document that details the services to be performed and the dates of your move. Bill of Lading: This is the official contract between you and the moving company. Make sure you take time the read the details before you sign. The movers should give you a copy of the bill of lading before they take off with your stuff. Inventory List: This accompanies the bill of lading and is a comprehensive list of everything the moving company puts on their truck. Make sure to check this against your own records. Shipping Weight: For an interstate move, the weight of the shipment is the most important factor to determine how much your move will cost. Certified Scale: Before and after picking up your load, movers will weigh-in at a certified scale. The weight of the truck is recorded on certified weight tickets. These are compared to determine the actual weight of your shipment. Kind of like when the doctor compares your records and tells you how much weight you’ve put on since your last appointment. Thanks doc. Moving Broker: When shopping for rates be aware that there are 3rdparties that appear to be moving companies but are actually moving brokers. A moving broker serves as a go-between for the customer and moving company. Like movers, moving brokers must also register with the FMCSA and comply with federal regulations. Get the quote in writing: An oral quote won’t hold up quite as well in court as a written quote. It might be the most boring information you’ve ever read (great nighttime reading) but take the time to thoroughly read your quote and bill of lading to make sure there’s nothing awry. Also, make sure that the written estimate is complete before signing. Compare costs: As we’ve mentioned numerous times, don’t just hire the first mover you come across. Vet multiple moving companies and get at least 3 in-home estimates. If you find one of the movers gives an estimate that’s far lower than the other two, run, don’t walk, in the other direction! Lowballing moving quotes is one of the sneaky ways pirate movers get you to hand over your things. Check licensing: All interstate moving companies must register with the FMCSA. This branch of the U.S. Department of Transportation gives every company an annual once over, checking things like insurance policies and safety ratings. Request the US DOT number of any prospective moving company and look them up in the FMCSA to make sure they are legit. Also, double check the number provided (and listed on the bill of lading) against the number displayed on the side of the moving truck. If the numbers don’t match, don’t let the movers take your things. Verify Forms of Payment: Make sure the moving company you contract with accepts more than just cash. If a mover is unwilling to take checks or credit cards, this is a good sign that something shady is afoot. For additional tips, check out our comprehensive article on moving scams. Understand Moving Insurance: Long distance moving carriers are required to present customers with full replacement value insurance. This coverage entitles you to the full replacement of any items that are damaged or broken during the move. To reduce the cost of your move, you may sign a waiver to turn down this level of coverage. Waiving full value protection leaves you with released value protection. This minimal coverage compensates for damaged or broken items at $.60 on the pound. Yes, the decimal is in the correct place. So, for example, if that sweet 70-lb. 60” flat screen you scooped up at Black Friday sales gets shattered, your mover would only be liable for $42. No bueno, amigo. Pack Properly: A mover is not liable for items getting damaged or broken if you did an inadequate job of packing. Notify Movers of Expensive Items: Any items with a value of more than $100 per pound must be listed in writing and provided to the movers. File a Timely Claim: If something does get broken, you must file a claim within 9 months of the date of delivery. Start Your Long Distance Move Today!